I was looking forward to having a nice slice of pizza today after, for whatever reason, not having pizza for a while. In Ottawa, I have become accustomed to Gabriel's Pizza and never had a bad experience after visiting or having their pizza delivered. When eating Gabriel's Pizza the product has always been hot and great tasting. I arrived downtown Ottawa today at 11:30 A.M. in hopes of beating the end of week lunch rush from the nearby office buildings. 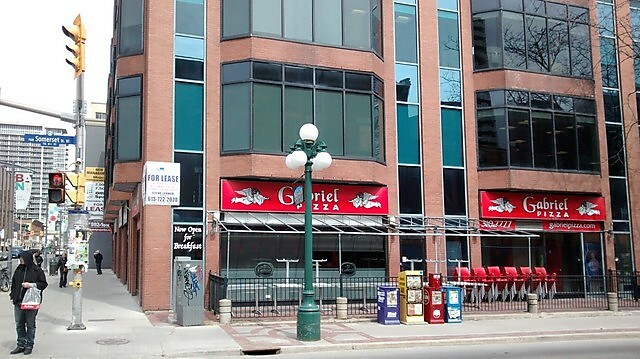 I entered the Gabriel Pizza location at Bank & Somerset (277 Bank Street, Ottawa) to find a more of diner type set up with a bunch of tables with about three customers enjoying their breakfast with an assortment of newspapers and other reading material available. One waitress was attending them and greeted me as I entered. I visited the counter to find the heated display case for three pizzas totally empty and turned off. I inquired with the waitress if I was too early to pick up slice. The waitress replied that there was no slices ready and none would be made today. I thanked her and dejectedly left to find other food. A downtown pizza location in a major city surrounded by offices on a the last day of the work week is bad for business. Most office workers, after enduring the weekly work week, love to go out for bite with coworkers on a the last day of the work week. Whether it be a regular week with a Friday or a shortened work week on a Thursday, pizza slices should be in demand. In this regard, Gabriel's fails to deliver.